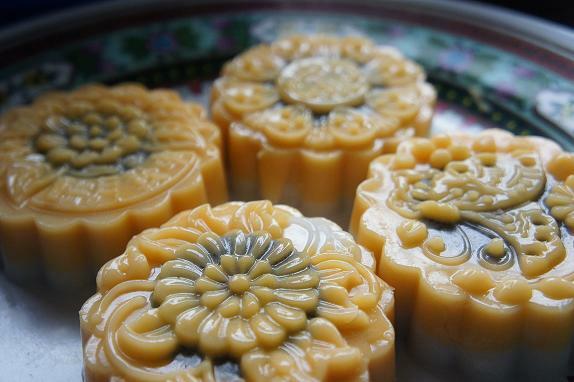 " First thing first, I edited the recipe for the SKIN of the Cendol Gula Melaka Agar-agar Mooncakes. I forgot to take into account that I made another 1/2 portion just to fill up the moulds. I am very sorry for the inconvenience caused. " I don't know whether its my problem or the recipe book but I absolutely hate recipe books that doesn't specify how much will the recipe yield. But after attempting 2 recipes from the same book, 3 actually, one sort of failed so its not recorded here, I realized its impossible to estimate the final result. This recipe below yields about 7 pcs but the previous one yields about 5 pcs only. 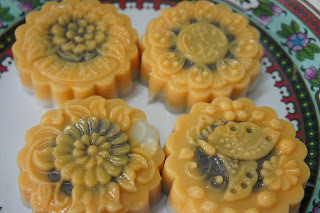 Another problem I encountered was that I always have not enough for my mooncake's skin portion and I would have to rush to make another portion to fill up the moulds so as not to make my mooncakes look like a piece of Kuih Lapis instead. Its always good to have more than not enough isn't it? Therefore, I adjusted accordingly and made 1 + 1/2 portion of the mooncake's skin. That explains if my recipe looks weird. I will be submitting this recipe to Aspiring Bakers #11 - Mid-Autumn Treats hosted by Happy Home Baking. 1. Chop and peel carrots into little pieces and steam for about 8 minutes or till carrots turn soft. Puree in a blender till fine. 2. Put everything else together in a pot including the puree carrot and cook till mixture boils. Turn off heat. 3. Sieve the mixture using a fine sieve. 4. Pour mixture into egg yolks mould and let set at room temperature for about 30 minutes then chill in the refrigerator. 5. Unmould the yolks when ready to use. 1. Cook everything in a pot except for the black sesame powder until mixture boils. 2. Add in the Black Sesame Powder and mix well. Remove liquid from heat. 3. 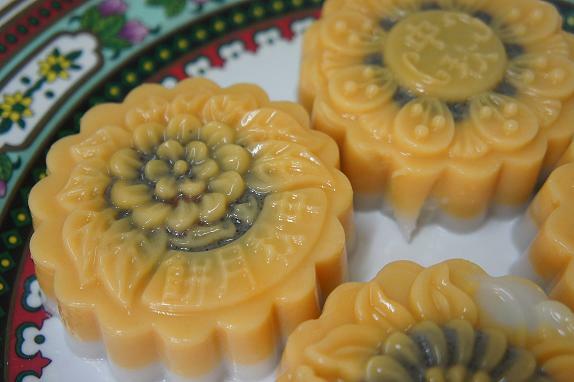 Pour the mixture into little round containers that fits into the mooncakes mould and put in the yolks in the centre of the mixture. 4. Let set at room temperature for about 30 minutes then chill in the refrigerator. 5. Unmould the fillings when ready to use. 1. Chop and peel pumpkins into little pieces and steam for about 13 minutes or till pumpkins turn soft. Puree in a blender till fine. 2. Mix everything in a pot except for the pureed pumpkin and bring mixture to boil. 3. Scoop out 150ml of the mixture and this is the white part of the skin. 4. Add in the pumpkins into the remaining mixture and bring to a boil again. Turn off heat. 5. Sieve the pumpkin mixture with a fine sieve. 6. In the agar-agar moulds, pour a little of the pumpkin mixture and leave to set. 7. Put in the black sesame fillings in the centre of the mould and then pour some white mixture. 8. Lastly., finish with a layer of pumpkin mixture. 9. Leave to set at room temperature for about 30 minutes then chill in the refrigerator before serving. I think the moulds come in different sizes. Which makes it hard for recipes to tell you how many pieces it will yield. As long as you know the capacity of your mould,(pour water in to measure the volume), then when you read the recipe, you will know how much you will get. wow you made this? looks impressive!! Been making some of these stuff myself, not the exact flavour though, and I can totally relate to the issues faced. Wendy is right, it's because of the different moulds used (and it's twice the problem because you will have to consider the moulds for both the fillings and the skin), i guess it's a try and error, from there you would be able to have a better estimate. Happy Mid Autumn Festival! Most importantly, no artificial flavouring, colour and preservative! All natural ingredients! Happy Mid Autumn to u too!